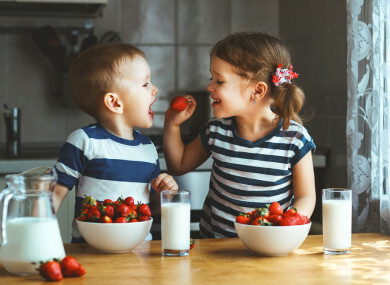 NO MATTER WHAT your original intentions were when your little ones were born, once they move away from milk, getting them to chomp on the likes of raw peppers instead of crisps isn’t always possible. But Airfield Estate, an urban farm just outside Dublin city, aims to inspire people of all ages to make better food choices – whether for the planet, their pocket or their own bodies. And no one is more up for the challenge than their culinary lead Luke Matthews. Having worked as a sous chef in the Michelin star Harwood Arms in London, Matthews then came home to Ireland to found Mews Restaurant in Baltimore – which quickly earned its own Michelin star. And now he’s at the helm in Airfield’s Overends Kitchen, aiming to get people to reconnect with their food by eating local, seasonal ingredients. And for Airfield, there’s no better place to change the way we eat than getting the next generation involved. Here, Matthews shares some incredibly simple things you can do at home to get your kids excited about their next meal. Eating breakfast everyday at the same time with kids is tricky enough. But you do need to sit down with them – often we see breakfast as ‘feeding time’ rather than ‘meal time’. For Matthews, eating with your family around a table is “what food is all about”, and it’s helpful to remember that meal times aren’t a battleground – they’re a chance to talk to and spend quality time with your kids. If there’s a small area where they can grow herbs or cress in the garden or in a window box, that’s key – they’ll get excited and invested in any meal you use them in. Older kids can cook a whole meal by themselves – you can even give them a turn cooking one night a week. This will prepare them for later on, make them more aware of what goes into a meal and make them more likely to eat it. We have to lead by example and try different things ourselves – we’re great at lecturing about eating your veg but not so much for actually doing it ourselves. In Overends Restaurants, Matthews shares that instead of a kid’s menu, they offer a ‘size me’ option, meaning kids can try a half portion of ‘adult’ dishes instead. We use lots of fresh fruit and vegetables in their prime – they’re the easiest and cheapest to get and they’re the best for our planet. If you need a hand finding out which ones are at their best right now, have a look at what’s in abundance in the supermarket – it’s usually a very good indicator of what’s in season. You can ask one kid to try to find loose veg with less packaging or make sure that someone has to check where the food is coming from – if they find peas are from the Middle East for example, you can use that as an opportunity to find food from closer to home. Kids love variety when it comes to the textures they eat – give them a crunchy carrot or some soft yoghurt and see which textures they do and don’t like. If you’re stuck for ideas, right now is the season for the likes of apples, turnips, swedes, spinach, parsnips, leeks, cauliflowers, carrots, cabbage, butterhead lettuce and brussel sprouts. Along with other must-keep rules to introduce such as no phones or TV at the table, Matthews suggests introducing one vegetarian meal a week. This is both to reduce the meat we eat (“something we should all try to do”) and to increase the amount of vegetables we are eating each week. There’s no need to make a big deal of it – you can even introduce it on the sly and just make something like a vegetarian lasagna filled with fresh vegetables. You can give them a budget for their school lunches and let them choose what they buy so they’ll see the cost of food. While some will buy junk food, some will really embrace it – it’s worth trying. At first they might make fried eggs and bacon for dinner, but as time goes on, you can introduce veg into that and that’s OK. The important thing is to get them invested in their food. Email “10 tips for getting your kids interested in the food they eat, according to an expert”. Feedback on “10 tips for getting your kids interested in the food they eat, according to an expert”.